Hall & Oates-O-Rama at Bumbershoot!! 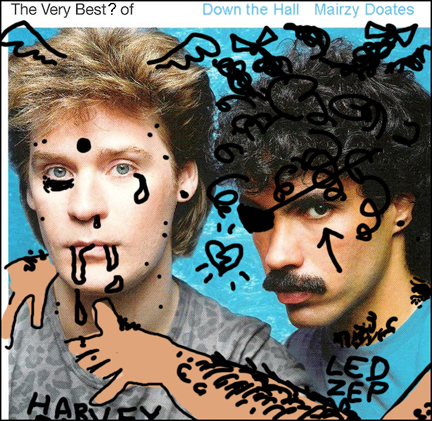 I can’t believe I don’t have a photo of Christopher and me dressed in Hall & Oates drag – what was I thinking?? The crowd was enthusiastic and responsive, and the rest of the performers were awesome. Wow, it went great! It was so fun! 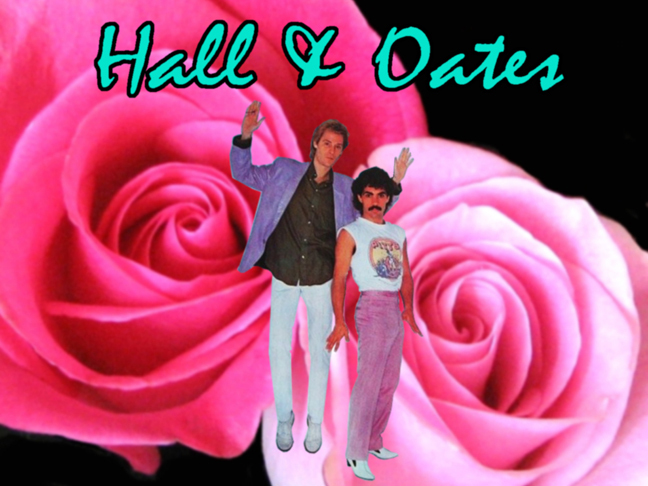 I photoshopped together the image below, with the two pink, puckered… roses… to go on the screen behind us for the “Hall & Oates” section of the evening. Really doing my best to exploit the CRAZY HOMOEROTICISM of these two supposedly straight performers, jeez. Video #2: I went onstage in Oates drag – curly wig, moustache, little cowboy boots – my first drag king performance, and it went over super well, thank you very much. Answering the rumors that Daryl and I were gay lovers, I finally owned up to it, and described how we met, accompanied by a slide show of our album covers. At the end of my bittersweet reverie, Christopher came out as Hall and tapped me on the shoulder, and we touched each others’ faces and kissed, and he carried me off stage. (The pressure on me: Christopher hadn’t kissed a girl since high school! At least I had a moustache on, maybe that helped.) It was hilarious and we were both laughing and had lost our wigs by the time we made it to the wings. Bumbershoot! Love it, hate it, but it’s unavoidable. I’ll be performing again at the Bagley Wright Theater on Saturday at 6pm, and the show is featured in the Stranger’s special “don’t miss it!” section. This particular literary/artistic/musical event is too egregious a conflict of interest for me to ignore. It’s true enough that as part of this program the author Sherman Alexie will be reading (with musical accompaniment) “What You Pawn I Will Redeem,” a marvelous short story that originally appeared in the New Yorker. Alexie is an exemplar of Seattle’s first-rate literary community, though why he continues to associate himself with gutter filth like The Stranger is beyond me. The Stranger-associated felons and deviants who round out the program include the paper’s most famous comic artist, Ellen Forney; former associate editor Sean Nelson (who is also a well-known musician); Stranger contributor Trisha Ready; and The Stranger’s editor-in-chief, Christopher Frizzelle. 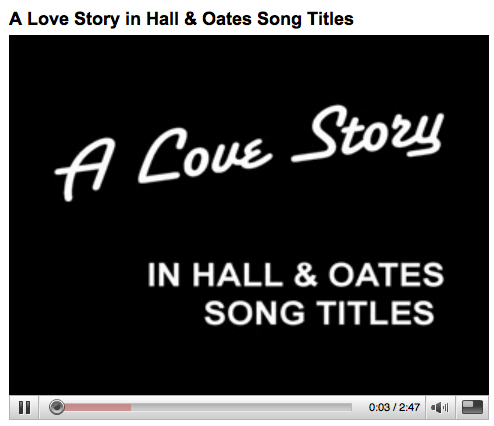 Sean, Christopher and I will be examining the rich topic of… Hall and Oates. I’ve made a few videos (jeez, I’ve been having fun with iMovie recently) and there’ll also be FABULOUS SURPRISES!!! I am hermit-crab-sitting this weekend, and made an exciting video of Vincent and Charlie clambering around my tub.